Archival records are located in the home of the current deacon. Steiner, Sam. "Farewell Mennonite Meetinghouse (Mount Forest, Ontario, Canada)." Global Anabaptist Mennonite Encyclopedia Online. June 2005. Web. 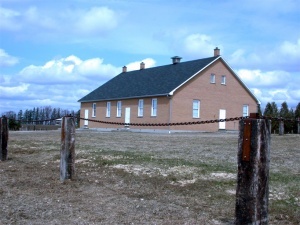 21 Apr 2019. http://gameo.org/index.php?title=Farewell_Mennonite_Meetinghouse_(Mount_Forest,_Ontario,_Canada)&oldid=115636. Steiner, Sam. (June 2005). Farewell Mennonite Meetinghouse (Mount Forest, Ontario, Canada). Global Anabaptist Mennonite Encyclopedia Online. Retrieved 21 April 2019, from http://gameo.org/index.php?title=Farewell_Mennonite_Meetinghouse_(Mount_Forest,_Ontario,_Canada)&oldid=115636. This page was last modified on 14 March 2014, at 19:59.